wow that is the coolest 120y that i've ever seen, it shows that with a proper ride height and wheels combo these can actually be very good looking cars. Looks really, exceptionally good, doesn't it? 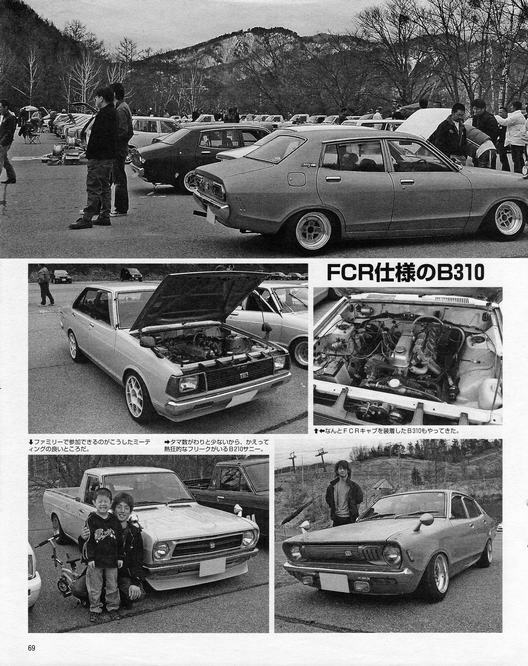 The caption for the B210 picture says something about B210 freaks and enthusiasts. Maybe D will translate for us. I can type the characters in but not read it. How sad is that? D, the lightweight engine guy, he has been able to translate magazine articles into Denglish if I remember correctly. The guy with the letter D as his avatar (the 1000 badge). I have to collect my car in Melbourne soon, was hoping to catch up with him. I haven't seen him around for a few weeks now. It is the brand of those quad carburetors. kk thanks for that, i love quad carbies, they just ooze cool.